Western blot analysis of extracts from HeLa and NIH/3T3 cells using p38 MAPK (D13E1) XP® Rabbit mAb (Biotinylated). Streptavidin-HRP #3999 was used for detection. 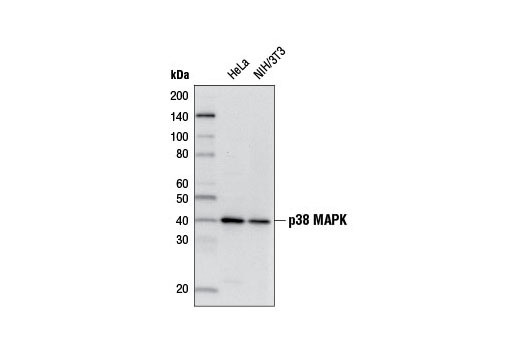 p38 MAPK (D13E1) XP® Rabbit mAb (Biotinylated) recognizes endogenous levels of total p38α, β, or γ MAPK protein. This antibody does not recognize p38δ, SAPK/JNK, or p44/42 MAPK proteins. Monoclonal antibody is produced by immunizing animals with a synthetic peptide corresponding to residues near the carboxy terminus of human p38 MAPK protein.